Patients in Erie choose cosmetic dentistry procedures/surgery for various reasons—to repair a defect such as a malformed bite or crooked teeth, treat an injury, or just improve their overall appearance. Whatever the reason, the ultimate goal is to restore a beautiful smile. For these and many other reasons, cosmetic dentistry has become a vital and important part of the dental profession. Common cosmetic dental procedures can be performed to correct misshaped, discolored, chipped or missing teeth. They also can be used to change the overall shape of teeth—from teeth that are too long or short, have gaps, or simply need to be reshaped. Porcelain Veneers - A procedure in which ultra-thin coatings are placed over the front teeth. 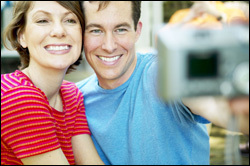 Veneers can change the color or shape of your teeth. For example, veneers have been used to correct unevenly spaced, crooked, chipped, oddly shaped or discolored teeth. For more information on Cosmetic Dentistry in the Erie, PA area call Modern Dental Group at (814) 456-0710 or (814) 836-1110!